I’m love with this new lip gloss. It’s a perfect, everyday wearable shade, which I believe could suit just about any skin tone. I have the Bare Escentuals Buxom sheer lip gloss in the shade ‘Debbie’ (I think its FAB that it has a proper name, only wish it was called Holly! :)). Which is a coral pink sheer shade, that has a hint of sparkle. Coral colours are ideal for us brunettes! The Buxom lip glosses are enriched with minerals, antioxidants and vitamins (A and E), which leave your lips feeling oh so soft and smooth. This range of lip glosses supposedly help your lips to look plumper and fuller, great for those of us without Angelina Jolies genes. I would say I did notice a slight difference in volume and the sparkly, iridescence in the product gives your lips a lovely glossy finish, without looking too over done. When I first applied it I was a little surprised at the slight tingly/cooling sensation that comes from the menthol in the formula, but now I can’t get enough of it! I love the way it feels on my lips and it’s not in any way uncomfortable. It also smells and tastes fantastic, a slight chocolate fragrance similar to some of the Barry M glosses. However, just like the Barry M glosses the scent doesn't last very long. It’s very easy to apply and stays on well, I just have to remember not to lick my lips :)! The slight problems that I have with this product, is that it’s quite pricy for a lip gloss (£18). On the other hand, you do get a lot of the product and a little goes a long way. To apply the lip gloss I use a lip brush instead, as I sometimes find that when I use the applicator, it applies a little too much of the product onto my lips. It does have a slight sticky texture but its nothing like the Mac lip glasses (I cannot stand those). Overall I really, really like this lip gloss, and to be honest I don't mind paying that bit more for a mineral based cosmetic. I definitely think it's a great investment as I find that it goes well with a lot of different looks, I get a lot of use out of it. There are also 3 other sheer colours in the range: Leslie, Samantha and Tonya, all priced at £18 each. Let me know if you’ve tried out any of the other colours :) and what you think of them. haven't already done so, check out her beauty blog here. Buxom glosses are one if the very few that I scrape the last bit out of! Love them! this is sounds like a great lipgloss! :) the color is so pretty! Oooh, this sounds great. Very pretty and natural. 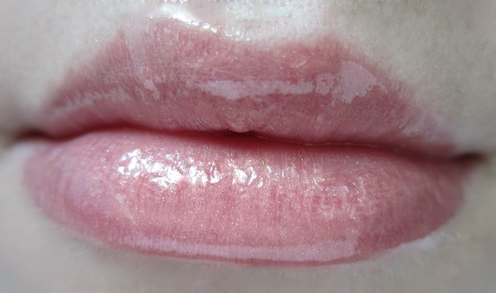 I'm looking for a light pinky-peachy moisturising lipstick (preferably)... Any suggestions?